This post contains all the information I have collected to date for Caroline “Carrie” Augusta Kanistanaux. I will update the page as new information is gathered, so bookmark this page and check back often. Carrie appears to be the daughter of Marleah (Moulton) Kanistanaux. The identity of her father is uncertain as well, but Laton Kanistanaux is suggested. She is identified as “Indian” in the 1870 and 1875 census records. She is documented as a sibling to Dr. Lee-o-netto. On her death record, her parents are both listed as “unknown“. 7-Sep-1857 – born in Canada (1875, 1892 NY State Census, 1900, 1910, 1930 US Census, Death Record). Born in NY (1880 US Census). 1870 – resident of Rathbone, Steuben Co., NY as a 13 year old Indian child born in NY with Laton and Mary (1870 US Census). 1875 – resident of Stockton, Chautauqua Co., NY as an 18 year old in the household of Layton Kanistanaux (1875 NYS Census). 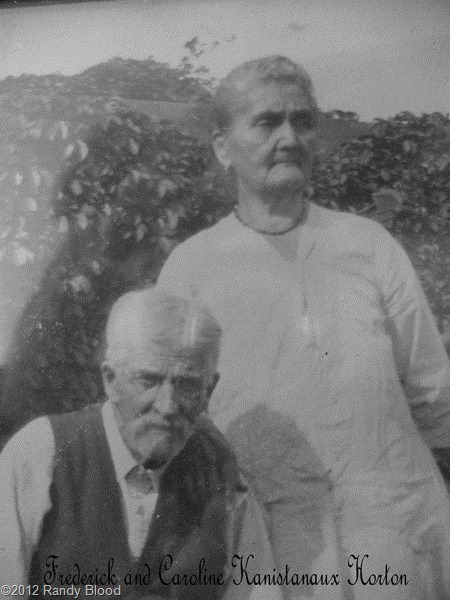 c1879 – married Frederick H. Horton, a farmer born about 1853 in NY (1900, 1910, 1930 US Census). 1880 – resident of Chautauqua, Chautauqua Co., NY as the 22 year old “white” wife of Fred Horton (1880 US Census). c1881 – a daughter named Mary B. born (1892 NYS Census, Horton Family Bible). c1883 – a daughter named Grace L. born (1892 NYS Census, 1900 US Census, Horton Family Bible). c1887 – a son named Leon F. born (1892 NYS Census, 1900 US Census, Horton Family Bible). 1892 – resident of Stockton, Chautauqua Co., NY as the 36 year old wife of Fred Horton (1892 NYS Census). 1900 – resident of Stockton, Chautauqua Co., NY as the 42 year old “white” wife of Fred Horton. She has been married 20 years and has 3 children, all living (1900 US Census). 1905 – resident of Conewango, Cattaraugus Co., NYas the 49 year old wife of “Freda H. Horton” (1905 NYS Census) . 1910 – resident of Randolph, Cattaraugus Co., NY as the 54 year old wife of Fred Horton. One of her children [probably Mary B.] has died since the last census. She claims she immigrated to the US in 1860 (1910 US Census). 1920 – resident of Randolph, Cattaraugus Co., NY as the 65 year olf wife of “Frank Horton” (1920 US Census). 1930 – resident of Randolph, Cattaraugus Co., NY as the 74 year old wife of Fred Horton (1930 US Census). 5-Jul-1931 – she died in Randolph at age 74 (obituary, death record). It is interesting to note that 1870 & 1875 are the only census identifying Carrie as “Indian”. Once she is married with a family she is identified as “white” in all census even though her siblings are being identified as “Indian”. In the 1920 Census she is labeled “white” but her mother tongue is given as “Indian“! Her death record lists her as white. Her obituary clearly shows Dr. Lee-o-netto as a sister. Her children received a Bible Story book from Lee-o-netto and they received inheritances from the estate of Lee-o-netto.